Just hate it, like that pic up-top, there, of The Doctor from Doctor Who in a First Contact-era Starfleet uniform. That’s some obvious fan-fiction I think is just sort of unnecessary. On the other hand, the distinction seems pretty nebulous, what with things like Wes Anderson’s Life Aquatic being pretty obviously Buckaroo Banzai: Against the World Crime League underwater, and at least two professional comic book writers launching their careers because they wrote entertaining slash fiction, or whatever. Honestly, I don’t even know, because I hate fan fiction. Even though I was paid to do a revamp of The Prisoner as a reality show for the SciFi Channel, and helped out my good pal Rick Austin on MTV’s The Big Picture: The Star Trek Logs, I don’t really think of that work as fan fiction. Although I, as a writer, was writing that stuff, I was, first, very much a fan of the material. And, of course, as a comics writer just starting out, I’d pitched potential books to the various copyright holders, so there’s that. It’s nebulous. A pitch is just really elaborate, well-done, and professionally-scribed fan-fiction until you get paid for it, right? EJ replied: “I’m shocked the comic went for that much – sure, it got a lot of screen time, but that’s not even something the prop department created. It’s an actual thing that you can buy. Heck, I bought it when it was published, and then bought a Spanish version after seeing it on the show. They ain’t hard to come by. Now that I think about it, there are probably multiple screen-used copies since one of them got tossed in a fire onscreen. And, you know, if it isn’t the screen-used copy of Watership Down, then it’s just a paperback book that was on the set for a while.” I responded that I was just glad there were no spacesuits on the show, because I would have really had a hard time not bidding on one of ’em, because I love Lost and the prop spacesuits so. And that’s when all the trouble started, because instantly I had the thought about a possible DARKSIDE STATION and how “Ann Arbor” wasn’t the city but the name of the woman who coordinated events on The Island from a neutral point above the Earth and whose relative position vis-a-vis orbital mechanics regulated the by-which and the when-to communication to the Island was able to be completed. And who was able to keep track of the various position-switches of the Island itself, and monitor the personnel changes with alacrity and aplomb. And made me think about what, exactly, a Dharma spacesuit might look like, circa 1977. Which takes us perilously close to fan-fiction. Which I hate. 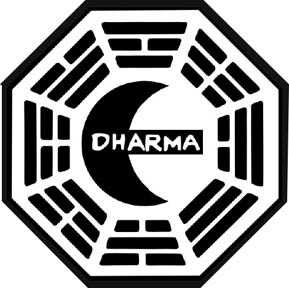 Maybe, somewhere, in the quantum universe, there’s a Season Seven of Lost where Commander Frank Lapidus and his second-in-command Ann Arbor (special guest star Rene Russo) are coordinating Hurley’s on-Island instructions from a Dharma moonbase, triangulating with the Lamppost to spot the sporadic appearances of The Island on Earth for Charles Widmore after what we know as the series “finale.” Because (of course) Jack’s corking of the light causes anomalous skipping about of the Island, and Darkside Station’s data comes into serious play. Which means a reveal of Darkside Station. And of their spacesuits. 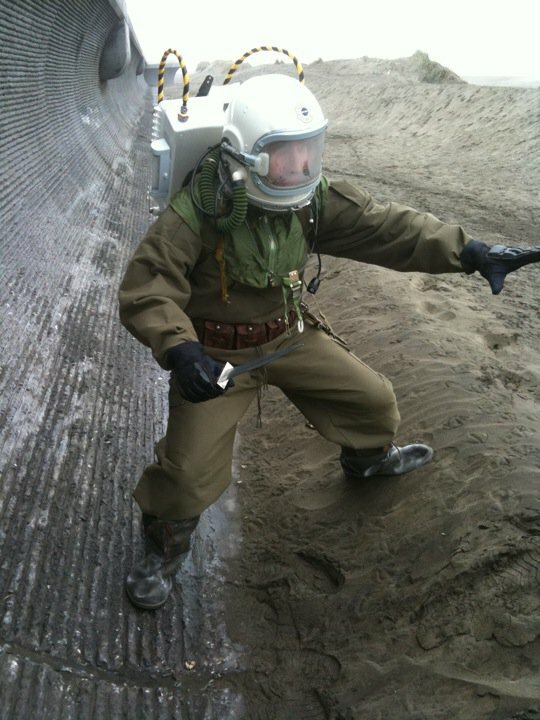 So my original brief to myself was that it had to look like something Dharma would have access to in the 1970s (which explains the surplus MiG helmet and West German chem suit as the base) but also look like something …the Lost art department could get together in ten man-hours for the week’s shoot of the episode. That Sam Rockwell flick Moon used IKEA silverware trays heavily in the set design, so I knicked that idea from them and used the common-knowledge build technique of the guys who build sandtrooper backpacks to string together plastic boxes with cable ties. 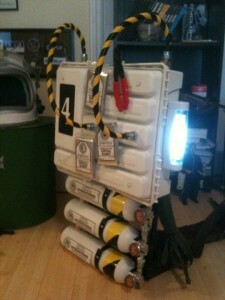 First order of business for the backpack was the base it’d be built on. 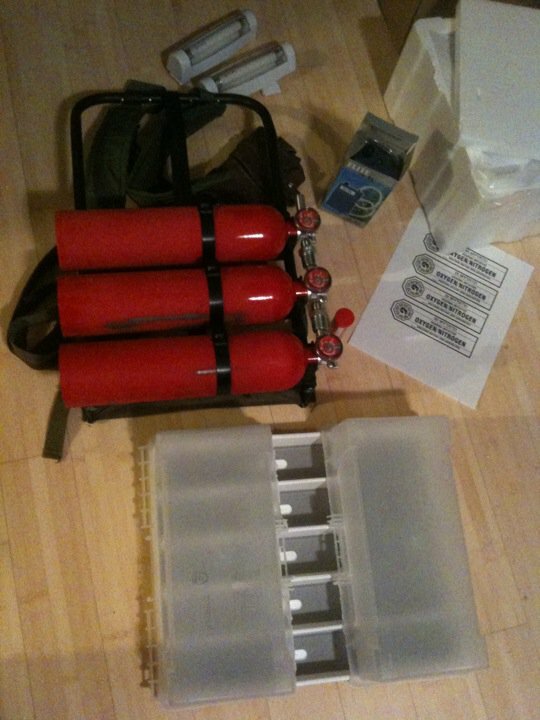 The Ghostbusters proton packs (“Why worry? Each one of us is carrying an unlicensed nuclear accelerator on his back.”) are built on Vietnam-era “Alice” frames, which seems good enough for me. An easy score on eBay from an Army surplus store. And of course we’d need air tanks on it. After briefly considering just a box-like shape, I ran across a photo of an open Soviet backpack with its exposed tanks and conduits and felt that had a good Dharma look. My first thought was just to fake it with white-painted two-liter soda bottles and old plumbing valves, but one of my pals said, “Two-liter Coke bottles painted white are just going to look like two-liter Coke bottles painted white; it’s Halloween, go to a costume shop and get a couple of kids’ fireman costumes and use the toy airtanks for it.” Well, after that, why not just buy real fire extinguishers? They already have valves, so I would only have to do rudimentary fittings. 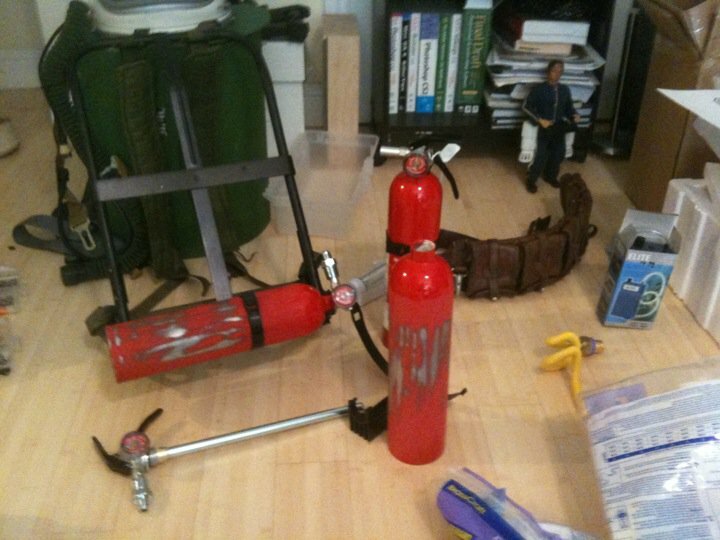 After the fire extinguishers were bolted to the frame, I collected two plastic art supply boxes, the silverware drawer, two under-the counter lights, and a battery-operated air pump for a five-gallon aquarium. 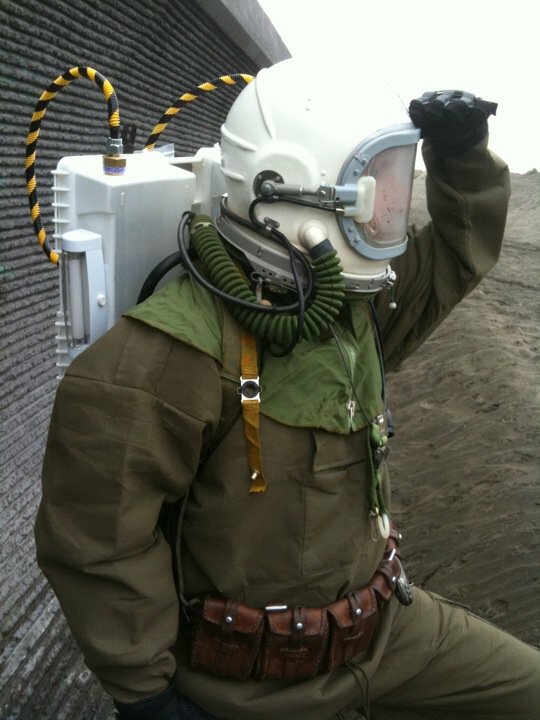 This last sits in the chest pocket of the West German chemical suit and blows air up into the helmet. Then it’s just a matter of painting and detailing. 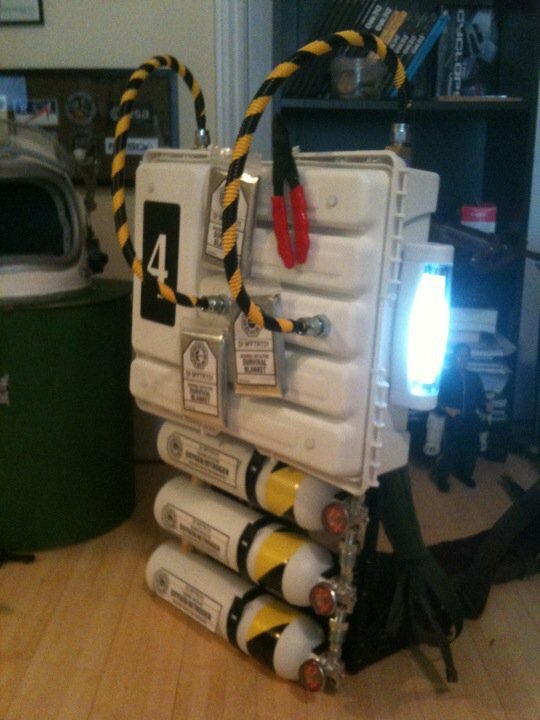 The tanks got several coats of white paint, vinyl yellow-and-black hazard tape, and Dharma “oxygen/nitrogen” labels with the Darkside Station logo. The silverware drawer gets inverted and strapped to the two art supply boxes, and the lights are velcroed to each side. Two yellow 24″ gas connectors get looped with black electrical tape to echo the hazard tape on the tanks, and are bolted into the plastic. Velcro strips were added to the silverware tray to give the eye some texture to look at, but begged the question: what goes on the back? Since the suit was going to feature a 1917 Swedish Army ammo pouch, I figured it be stuff that you might need every once in a while but was never mission-critical. So I put some velcro on the handles of an old coax crimper that was kicking around in my tool box and positioned it so the spaceman could reach back up over his shoulder to get it easily. It still needed a bit more something, so I got a few survival blankets and stuck them to the back. There are three different Dharma logos on them, because I had the thought that Dharma members privately think this is the most useless item Dharma issues them. You don’t need them in LA, you don’t need them on a tropical island, you don’t need them in space. So the Dharma guys trade them amongst themselves, as proof you’ve met folks from another station. I guess. Because I hate fan fiction. … the Man in Black’s Roman shortsword used to kill Jacob. Because when you’re writing fan fiction, you never know who might show up again. Okay, here’s the thing. Oddly enough, I was thinking about this last night and decided this is just your creative process at work. There is little here that actually ties it to Lost. This is all essentially new ground with a familiar backdrop. What you essentially have is a secret moon base that was once run by some covert organization that worked above and beyond all governments. The covert business isn’t what it used to be, it’s fallen on hard times. And now the organization has a new head, a benevolent head who plans on using all of the resources for the greater good. Then you are focusing on one such asset, the moon base, with a new sheriff in town and his new deputy. Back in the early 80’s, when they were arguing over the funding for Regan’s proposed “Star Wars” missile defense system, one of my customers worked for NSA and he was laughing, because according to him, “it was already up there”. To me, this clicks in well with a moon base no one knows about. What I’m trying to say is this isn’t “fan fiction” per se, as much as it is inspiration for a new idea/new project. Sure, it has some roots in Lost. But I think what you are truly doing is creating. And Larry Hama’s Nick Fury Jr. idea became GI Joe of the 1980’s. Unrecognizable. So, go, have fun with it and let go of the guilt. Thanks for thinking so much about this. 🙂 Ever see that old Gerry Anderson show UFO? That’s all I was thinking about: Rene Russo will have to wear a purple wig. I remember UFO fondly. As for Renee Russo specifically in a purple wig…whatever floats your boat. Wow I hate fanfiction too! I also write it as well! Actually I am dabbling it in to build up my skills to write my own fiction / non fiction. The thing I dislike most about it is that most fans use it to air grudges or grievances against the writer(s), show, book or what have you. I’ve actually tried hard to create plausible stories that fit within the context of the shows I choose to write for. 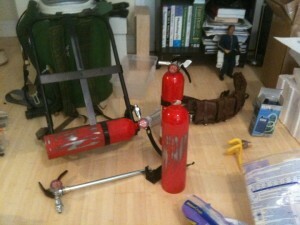 I also like costuming and props and found your page through therpf.com! Mark, that’s awesome about your NSA guy. “It’s already up there.” HA! Welcome, Chris. I love the RPF.